Sheer adrenaline rushing through our veins as we approached the beloved DXpedition cottage in Lemmenjoki. October was heaven with sensational catches from the Pacific, November was hell because of a huge solar storm. What would it be like now in Lemmenjoki? We would soon find out - I after a hiatus of two years, Jim after a brief pause of two months. Basic arrangements followed the tradition of the previous years. On Friday evening, November 26, I and Jim Solatie met at the Helsinki railway station to catch a train as far north as the tracks go to reduce time spent driving on the road. After arriving in Kolari on Saturday morning, we drove up to Kittilä to shop for groceries and then headed to the wilderness. As we were approaching Lemmenjoki, we met Hannu Asikainen and Hannu Niilekselä, the outgoing pair of DXers, to exchange the latest news about what's happening on the dial. The two Hannus told us to expect Oregonians on graveyard frequencies, and their prediction proved to be true. Lemmenjoki was as wintry as you can imagine this time of the year. Matching the unexpectedly heavy snowfall around Helsinki, quite a bit of fresh snow had fallen during the previous week coating everything white. 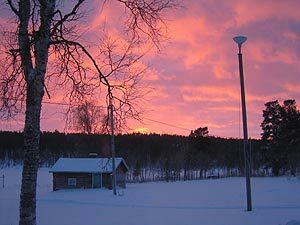 During our stay, the temperature hovered mostly around -20 degrees Celsius (-4 F), ranging from -30 to -10 Celsius (-22 to 14 F). 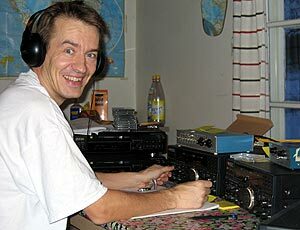 Some of the highlights of the DXpedition had nothing to do with DXing. On Sunday we were invited to celebrate our landlady's 85th birthday. Many guests wore traditional Saami (Lappish) clothing, which are brightly colored just like the aurora borealis (northern lights) at its best. 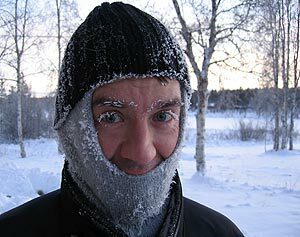 It was quite an experience to hear people singing Lappish hymns, which of course we didn't understand at all. We also had a close encounter with the Arctic fauna. 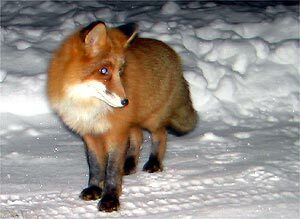 I spotted a young fox behind the window one night at 2 a.m., the same one which Jim had seen on one of his earlier DXpeditions. Eventually DXpedition LEM202 turned out pretty good. We had great conditions towards Oregon and Washington, and although not much was heard from anywhere else, that was enough. On the negative side, both had flu, Jim on arrival, and I later during the week. The cabin is Spartan in terms of amenities, and if you're not feeling well, you could use some additional comfort. One new type of luxury was however introduced; Jim took along lunchboxes from his favorite Thai restaurant. Extremely hot - but it didn't bring about any conditions to Thailand. Propagation conditions followed a fairly similar pattern on most days. In the afternoon around 12-15 UTC the most common AM stations from all around Asia would be audible, fighting with strong Europeans. Without any clear focus, under these conditions it was close to impossible to find any new stations to identify. In general, Asia was quite a disappointment. The best experience from this direction was Monday, November 29, when we spotted more Chinese stations than normally around 1215-1415 UTC. Later in the evening we either reviewed tapes or slept, as there was hardly anything interesting to listen to - not even focused conditions to any particular part of Europe. Only on Thursday, December 2, Australian X-band stations made a brief appearance around 1730-1800 UTC. That was all we got from Australia and Oceania, as the coveted island nations of the Pacific completely eluded our ears. Maybe next time. This is however the big new frontier at Lemmenjoki, where a new 1-kilometer-long wire antenna, pointed at 30 degrees, was first erected this season and proved to be remarkably successful in October. During the night, the first trans-Atlantic signals surfaced around 2100-2300 UTC. They normally included CFFB Iqaluit NU (1230 kHz), Harbour Light, Grenada (1400 kHz), and about a dozen other common stations, including a bunch of Brazilians in the upper end of the mediumwave dial. Nighttime conditions however remained rather poor, with only Brazilians occasionally coming well enough to warrant hunting for new stations. Even later during the night nothing much was heard from elsewhere in Latin America. African stations were absent all the time, not even South Africa was heard on 846 kHz, which is an empty frequency every night. However, in the wee hours of the morning 846 kHz did reveal Kalmykskaya GTRK, which we had targeted for years. The real thing began around 0500-0600 UTC, when trans-Atlantic signals started to gain strength and Europeans began to weaken. At this time conditions often favored Newfoundland, US East Coast, the Great Lakes or the Rocky Mountains for a very short period, before quickly moving on to the West Coast, where the focus of the conditions would remain for as long as any stations were audible. On some days this morning session lasted for about two hours, but on Wednesday, December 1, and Thursday, December 2, stations from the northwestern corner of the US remained audible until around 1400 UTC. During the first hour or so the conditions were often a bit surprising. For example on December 2, there was a brief peak of stations from New England. Jim took full advantage of this by capturing in rapid succession WROW Albany NY (590 kHz) and WICC Bridgeport CT (600 kHz), probably the best catches of the DXpedition. Though not as rare a station, I was most happy about catching KOIT San Francisco CA (1260 kHz), which happened to be my favorite AM station when I lived in the Bay Area earlier this year. It brought back some really nice memories. Mexican stations were an added bonus. XEPE Tecate BC (1700 kHz) was booming on most days, and other stations were heard especially from Baja California and Sinaloa. The most common Alaskan and Hawaiian stations were audible on most days, but nothing new for us aside from KAGV Big Lake AK (1110 kHz), which was heard with LSB test transmissions on a couple of days. The signal strength was huge, so this is bound to become a common station in northern Scandinavia once they start operating regularly. Tropical band frequencies sounded completely dead most of the time. Signals began to improve towards the end of the DXpedition, with some nice strong signals on Saturday, December 4, our day of departure. Hopefully our followers got more out of these. Space weather was favorable throughout the DXpedition, with the solar flux hovering around 97-113, and A index from 1 to 17. Strangely, conditions deteriorated towards the end of the week, altough indices improved. Nevertheless, just as we departed midday Saturday, the A index was almost zero and Asian mediumwave stations were heard earlier than on any previous day. 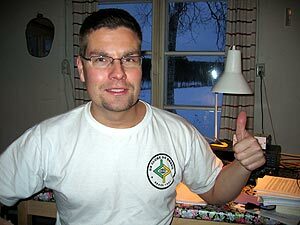 This seemed to indicate good conditions for the incoming DXers, Antti Aaltonen and Timo Reiniluoto.